Modern chicken was domesticated from the red junglefowl, gallus gallus, approximatey 8000 years ago. The junglefowl lived in a flock in the protection of a thick undergrowth. Even though breeding has increased the growth and egg-laying capacity of modern chickens, they still share many behaviours and needs with their ancestor. Naturaly, chickens form flocks of 20 chickens and 1-3 roosters. Flock size can vary from 5 to 30 chickens. The rooster tends to his chickens, ensuring their safety and mating with them every night during the egg-laying season. Young birds live on the edges of the flock. Even though chickens rest tightly side by side, during daytime they keep some distance between each others. Chicken flocks have a rather strict social order, where the oldest and largest birds with the largest comb (the red thing on the top of a chicken's head is called a comb) dominate. Young chicks begin finding their place in the pecking order at the age of 6-8 weeks, and the order is all settled in 1-2 weeks. Chickens can recognize only up to 80 other members of the flock. When the flock size is larger, like in most henhouses, the pecking order is never stable. Fights are common in such circumstances. Roosters have a calming effect on flocks of chickens. Some producers keep roosters in their henhouse just to keep the peace. Chickens have an excellent eyesight, and they can see 330º around them. In the dark chickens can barely see, so they climb up to roost or trees to spend the night, safe from predators. However, chickens can see UV-light, and in fact recognize one another by sight. Roosting during the night is a strong need for chickens, and the roost must be about 1,5 metres from the ground. The most dominating birds fly to the top, while other birds settle close together to the lower branches. In a henhouse, where the light program is controlled, "night" has to come slowly after a period of "twilight". This serves as a warning to the chickens, and they can make their way to the roost while they still can see. The roosts actually also help young chickens to develop 3D visualisation, if they are allowed to roost when very young. Chickens allowed roosting later in life never learn to use them, and have poor 3D visualisation. After a night's rest the chickens wake up at sunrise, and lay eggs. After laying an egg the chickens eat, and would spend 90 % of the day searching for food. In midday the birds rest and bathe in sand, and afternoon is dedicated for tending to their feathers and mating. Right before night time chickens eat as much as possible, storing energy for the night. Chickens' diet consists of seeds, green feed, insects, worms, larvae and even mice. 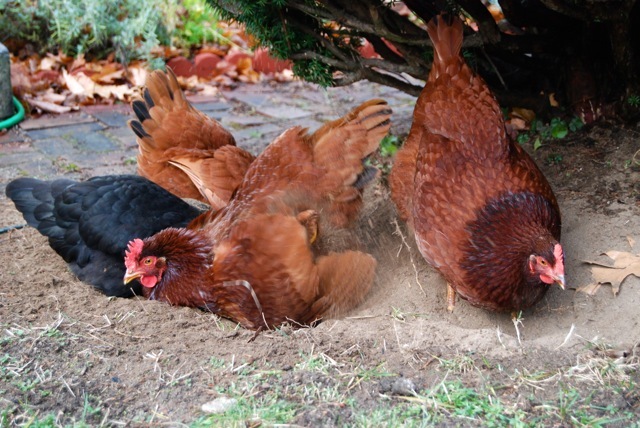 Chickens prefer to search for their food by pecking at litter or ground, instead of eating for a full bowl. Bathing is an important need for chickens. Chickens bathe in dust every other day, throwing sand on their back and flapping their wings. Sand helps to keep parasites away from the bird's skin, and keeps the feathers healthy. Chickens bathe also in sunlight, opening their wings and sometimes laying down on their backs. The reason or benefits of sunbathing are still unknown. Like other birds, chickens also arrange their feathers and stroke them with their beaks, spreading the fat from their skin to the feathers. This nsures the feathers' insulating capacity. Egg-laying hens in henhouses are bought from breeding farms, where fast-growing but infertile hybrids are created for production use. These animals simply lay eggs until they are culled and the meat is either destroyed or used as animal feed. Naturally, a chicken would lay eggs once a year, during springtime. The chicken leaves the herd to build a nest. She walks to her nest each morning, lays one fertilized egg, and returns to mate with the rooster in the afternoon. Egg-laying stops when she sees about 10 eggs in her nest. She will then incubate the eggs, occasionally turning them around, for 21 days. The chicks recognize their mother from her sound right after hatching. Their yolk sac has enough nutrition for two days, after which they need to start picking food on their own. The mother teaches the chicks where to find food. Chicks develop fast: they run at the age of 2 days and fly short distances at the age of 10 days. For the first three weeks the chicks cannot thermoregulate well, and must sleep under their mother's wings. At 1,5 months of age they already sleep on roosts. Until three months of age the chicks stay with their mother. After that the chicken drives male chicks off to another flock or to the borders of the current flock. Chickens in modern henhouses live either in small cages or in flocks of tens of thousands of birds. They rarely have any litter to peck, and their food is served from a bowl. Roosts are rare, and often too low. Bathing behaviour is often impossible due to lack of space and bathing material. If chickens are not allowed to roost or to search for their food, they will get frustrated and stressed. This leads to disruptive behaviour, which can be very serious. Frustrated chickens often peck one another, tearing away feathers and causing wounds. Chickens are omnivorous, so seeing blood excites them to peck on the target even more, possibly killing the victim even if it is a chicken of the same flock. Cannibalism among production chickens is not rare, but it is abnormal. 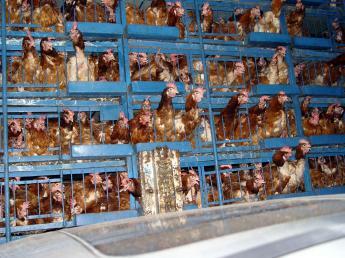 In production henhouses, the eggs are collected daily. The visual stimuli of "enough eggs in the nest" never occurs, and the chickens continue to lay eggs indefinitely. Their metabolism is thus under heavy stress: it is meant to create 15 eggs a year instead of 300. To meet the production requirements, the chickens are fed heavily, so they may grow too fast. Fast growth combined with small cramped spaces (cages) causes leg injuries and weak muscle strength. How to reduce disruptive behaviour? Using red light prevents the chickens from seeing blood, thus decreasing their instinct to peck an already injured bird. Broilers are hybrid birds reared on floor in flocks of tens of thousands. They are bred to grow incredibly fast and to become large, so each animal would produce the maximum amount of meat. A broiler lives only five weeks. It is sold from the commercial breeded as an egg or small chick to the broiler farm. Because their fast growth and cramped space, leg injuries, heart and circulatory problems are very common. Many broilers die suddenly of heart failure, and are simply removed from the poultry house. When the birds are five weeks old, they are gathered to crates using a "hoover", a chicken catcher. Gathering and transporting the animals often leads to immensely painful broken legs and wings in addition to stress and fear. Chickens breeding broiler-breed chicks are also bred to grow as fast as the broilers. However, such a fast growth would kill the animal before it's able to reproduce, so the broiler dams are fed only 30 % of what they would need. At the age of 39 days, a freely fed broiler chicked weighs 2,2 kilos, but a broiler dam on limited feeding weighs only 615 grams. The dams are constantly hungry and frustrated, so they fight often during feeding time, and drink water excessively to ease their hunger. Elevated stress levels have been measured. Stereotypical behaviour and pecking are common due to high stress.